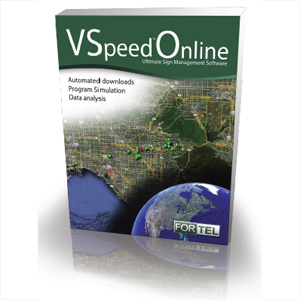 VSpeed™ Online - J.O. Herbert Co., Inc. Revolutionary sign management tool that allows the ability to program signs, simulate functionality, analyze data, and remotely deploy configuration changes with an easy to use interface. Centralized web programming: Stay up-to-date with the latest configurations for each sign. Easy sign management: Access all sign data and programming from a map of all your signs. Simplified Programming: Program your signs using an intuitive “drag and drop” style programming method that will help avoid programming mistakes. Simple Data Management: Keep all sign speed data in a single database allowing reports to be retrieved on demand within user-specified date ranges. Graphs and Calculations: Percentile graphs and time of day graphs to allow fast discovery of times when law enforcement measures are neccessary. Automated Data Summaries: 10mph incremental analysis lets you know what percentage of vehicles are slowing down at each 10mph increment. Configuration Simulator: Simulate a program and demonstrate functionality to others before deployment. Auto downloading: The software will automatically connect and download data from all signs equipped with an IP modem so that your data and sign programming is always up-to-date. Intuitive Warnings: Maintains a running log of power failures, sign functions, and other important events to enable up-to-date reports of sign health and solar status.